If you want a healthy grass lawn to last through warmer months, you should follow a few simple tips when mowing. The right cutting height setting on your mower is important for overall grass lawn health. 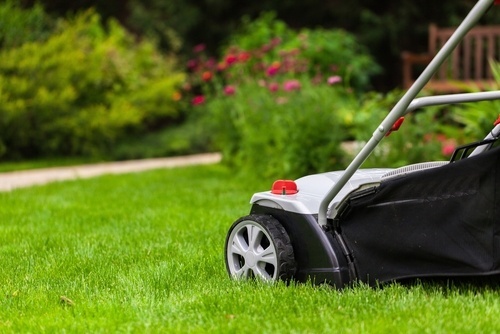 How frequently you mow also affects the health of your lawn. You might be tempted to remove grass clippings after you mow, but leaving them helps your lawn receive healthy nutrients. You might be surprised to learn that mowing patterns also influence the health of a grass lawn. Finally, you should keep your mower blades sharp so they do not damage your turf. 3 to 4 inches is the ideal grass mowing height for most lawns. If you mow your turf closer than that, you run the risk of damaging grass health by reducing the photosynthesis that occurs when grass leaves are long enough. You also subject your lawn to greater stress from the environment and open the possibility of weed invasion. There is a guideline called the one-third rule to follow when mowing. For example, if you are going to mow your lawn so that it is two inches high, then you should not let the grass grow taller than three inches before you mow again. Clippings should be left on the lawn because they provide helpful nutrients to the turf. It is okay to remove excessive clippings if you have mowed the lawn infrequently, otherwise there is no need to bag or rake them. If you want to promote upright shoot growth, then you should vary the mowing pattern at right angles every other time you mow. If you do not keep your mower blades sharp, you run the risk of tearing and injuring the grass blades instead of cutting them, which may cause browning of your turf.